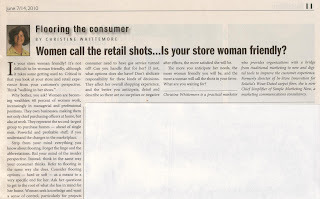 Here is the 4/29/11 issue of Retail Experience in the News... recapping the latest articles and links shared on Twitter with the #retailexp hashtag this past week. 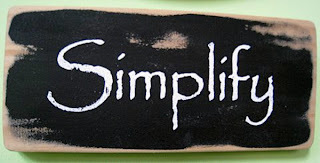 Simple Marketing Now, a marketing communications consultancy, helps organizations integrate social media and content marketing with traditional marketing to better connect with customers and improve business profitability. Simple Marketing Now issues the Social Flooring Index which monitors the social state of the Flooring Industry, Flooring The Consumer, about marketing to women and the retail experience. For more information, and the Simple Marketing Blog, about social media and content marketing to better connect with customers. Here is the 4/24/11 Happy Easter issue of Retail Experience in the News... recapping the latest articles and links shared on Twitter with the #retailexp hashtag this past week. Interesting #retailexp: stores must reach out, touch more mobile users http://ow.ly/4Ca6l How R U doing this? Have a great Holiday and an inspiring Earth Day! A recent conversation about the food and grocery retail experience with Penny Hammond, co-president of Columbia Business School's Alumni Club of New York and expert in food restrictions, had us discussing Trader Joe's, the national chain of neighborhood specialty grocery store. The Trader Joe's experience is always one of delicious discovery and thoughtful customer focus. In a recent visit, when the daffodil bunches had run out, a 'crew member' [aka store associate] found a handful and gave them to my distraught daughter. No charge. I love browsing and shopping there and wish one were closer to me. My conversation with Penny reminded me of a CNNMoney.com article about Trader Joe's that my nephew, Sean Sullivan [who contributed My Election Day Experience], shared with me. It's titled Inside the secret world of Trader Joe's - Full Version and is worth reading for perspective on this savvy retailer that "elevates food shopping from a chore to a cultural experience." The article states that Trader Joe's now "boasts 344 stores in 25 states and Washington, D.C., and strip-mall operators and consumers alike aggressively lobby the chain, based in Monrovia, Calif., to come to their towns. A Trader Joe's brings with it good jobs, and its presence in your community is like an affirmation that you and your neighbors are worldly and smart." I agree! We tried to petition Trader Joe's to come closer to our neck of the woods. Furthermore, "the genius of Trader Joe's is staying a step ahead of Americans' increasingly adventurous palates with interesting new items that shoppers will collectively buy in big volumes." Trader Joe's sets food trends. Sales for last year approximated $8 billion [equivalent to Whole Foods]. Stores remain relatively small with a limited [~ 4,000 SKUs vs. the usual 50,000 SKUs that traditional groceries carry] and carefully curated selection of products that turn over frequently. The article refers to The Paradox of Choice: Why More Is Less and how having too many options available for shoppers can paralyze them, preventing from making purchase decisions. No such problem at Trader Joe's where those curated selections mean deliberately limited options. 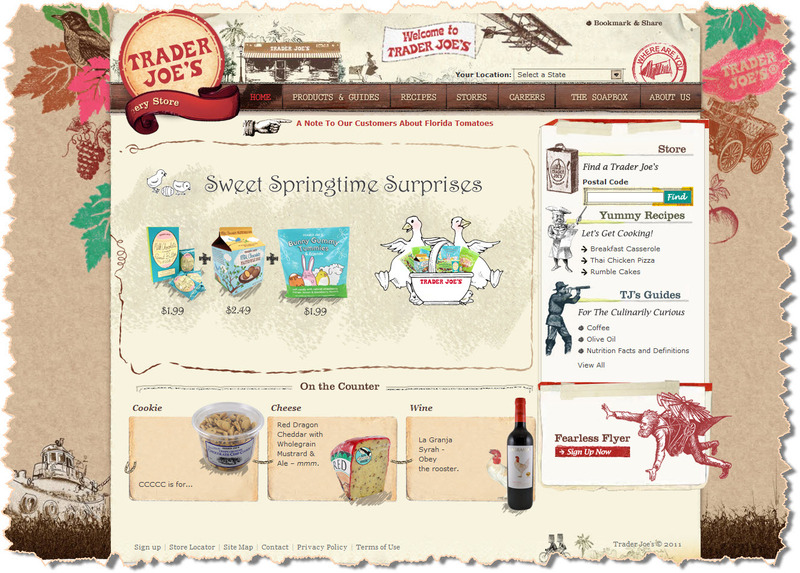 It details the transparency that Trader Joe's has brought to the grocery model and the simplification it has brought to food distribution by seeking to "minimize the number of hands that touch a product, wherever possible." Did you know that placement decisions in-store have to do with what's best for customers rather than solely on profits? On top of that, you find at Trader Joe's the kind of genuine personal engagement that has patrons returning regularly for more. Each store feels just like a neighborhood grocery retail experience. 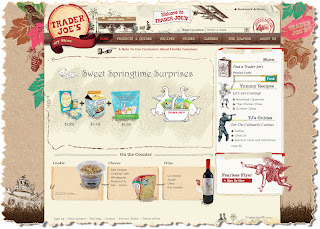 Long time readers of Flooring The Consumer may remember an early post from 2007 titled Trader Joe's: Where Values Drive the Brand based on a presentation by CEO Dan Bane. It's a popular post. If you enjoyed this article, perhaps you would consider subscribing to Flooring The Consumer via email or RSS. 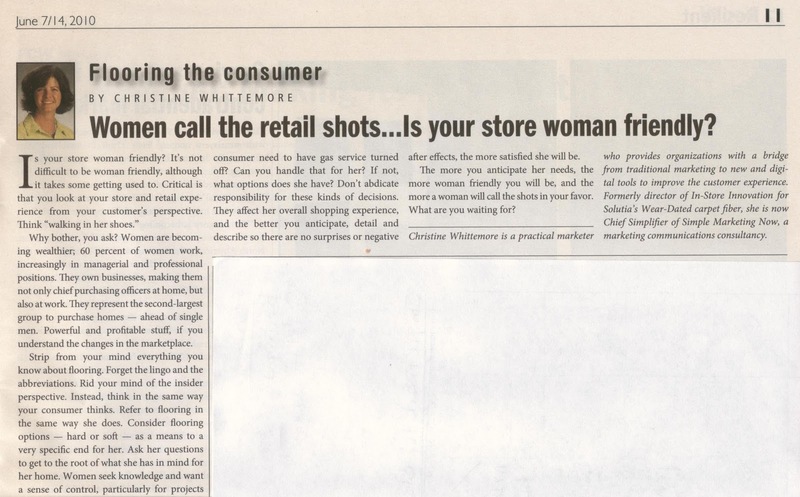 For your weekend reading pleasure, here is the 4/15/11 issue of Retail Experience in the News... recapping the latest articles and links shared on Twitter with the #retailexp hashtag this past week. We may be fully immersed in April, but I think you will enjoy these updates from this past March from Simple Marketing Now. I've categorized posts into Social Media Marketing Resources and Simple Marketing News. Looking toward April, I'd love your input! Over these next few weeks, I intend to explore several ideas that have been percolating for a while. One includes a series focused on reviewing business blogs and offering suggestions for improvement. 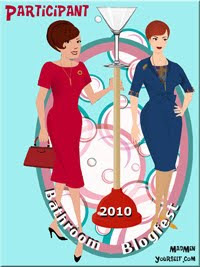 If you have a blog and would like to be included, please let me know. Another has to do with questions small and medium businesses and retailers have about integrating digital and social tools into their retail and business experience. What is working for you? What isn't? What questions are your grappling with ? I'd love to hear. March was intense - to say the least! Not only did I take part in my inaugural online seminar with MarketingProfs - see Press Release: Concerned About Managing Your Company's Reputation in a Social World? - but I also celebrated two years as Simple Marketing Now! Details are in Happy Simple Marketing Blog Birthday #2! I was invited, too, to take part in a New York Law School panel discussion - see Press Release: New York Law Panel Discussion 4/4/2011 - during which many aspects of privacy, disclosure and consumer protection came up. I plan on summarizing many of those points in a separate blog post. At the beginning of March, I participated in the annual BRITE Conference at Columbia Business School. I summarized highlights in BRITE Conference 2011: Highlights and BRITE Conference: Steve Rubel & 11 Digital Trends to Follow in 2011. I particularly enjoyed meeting in person BL Ochman from What's Next? Blog and Denise Lee Yohn from Brand as Business Bites. Denise is as fascinated about the retail experience as I am and we've already had one conversation during which we shared retail observations. I'm looking forward to more! This 4/8/11 issue of Retail Experience in the News... recapping the latest articles and links shared on Twitter with the #retailexp hashtag this past week... comes to you from Dallas, where I've spent the past several days with the Surfaces 2012 Education Advisory Council discussing flooring education ideas. I hope you enjoy the links below. Definite food for thought in US Census data highlights: hispanic, local http://ow.ly/4tbgk How will this affect your #retailexp? Fascinating perspective on buying: 10 cognitive biases affecting decisions http://ow.ly/4tV6P #retailexp How do these affect yr customers? Here is the 4/1//11 issue of Retail Experience in the News... recapping the latest articles and links shared on Twitter with the #retailexp hashtag this past week.